From the diminutive ASIMO from Honda to the colossus in the animated film Iron Giant, kids around the world know that robots are cool yet complex machines. Advances in robotics, fuel plans from NASA that read like science fiction movie scripts. Back on Earth, what can we expect over the next few years in robot technology for the consumer? Hack your Aibo robot dog? Been there. Print your own robot? Whoa! 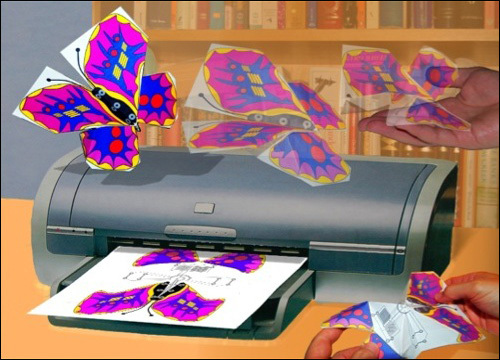 Consider recent advances in inkjet printing. The same basic technology in a $100 home printer has been used by researchers at the Wake Forest University School of Medicine in North Carolina for the printing of "bio-ink" skin tissue as potential grafts for burn victims. It may also provide the basis for the printing of complete artificial organs such as kidneys and livers. Unappetizing? Homaru Cantu, the executive chef at Moto, a restaurant in Chicago, uses inkjet technology to print a balance of flavored (sweet, sour, salty, bitter) solutions onto custom edible paper. And the company SweetArt now offers a computer printing service that lets you scan in photographic images and make printouts that are edible using a spray sugar technology. The tasty outputs are suitable for use on sheet cakes and the like. Similar applications are currently being used to fabricate polymeric drug delivery systems. Such an ability to customize drugs by pharmaceutical components and dosage may make possible personalized fabrication and delivery of medications. Conceptual fabrication of an origami robot butterfly. Still, 3-D printing using inkjet technology is already a well-established technology. The Thermojet solid object printer manufactured by 3D Systems uses inkjet technology to print small solid objects such as scaled architectural models. According to Wohlers Associates the cost of 3-D printers could drop to $10,000 by the end of the decade, and eventually below $1,000. But for robots we need more than form. To start, we need circuits. The Nobel Prize in Chemistry for 2000 was awarded to three scientists: Alan Heeger, Alan MacDiarmid, and Hideki Shirakawa -- the co-discoverers of electrically conductive polymers. Their work initiated the field of polymer electronics and its wide-ranging applications from molecular electronics to foldable electronic newspapers. 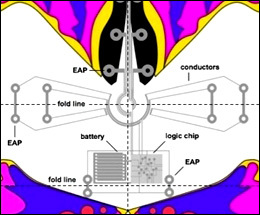 Detail of robot butterfly printed circuitry (concept). Semi-conducting polymers such as polyaniline and polypyrrole can be doped to act as "synthetic metals" with high electrical conductivity and the ability to act as semiconductors. Semiconductor devices that are potential targets for these polymers include LEDs, photovoltaic cells and field effect transistors (FETs). Flexonics (see sidebar) seeks to produce fully functional mechatronic (mechanical and electronic) devices without assembly using organic semiconductors. These devices will integrate structural, mechanical and electronic components during fabrication using an all-inkjet printing process. Flexible substrates printed with organic transistors are increasing in reliability. They could make possible integrated sensors, toys, even interactive furniture. Organic semiconductors would be cheap, easy to manufacture and easily cover large, irregular areas says Howard Katz of Lucent Technologies' Bell Labs. "Flexonic devices will be fabricated using an inkjet printing technique. Through selective material deposition, a mechanism can be built layer by layer with a high level of complexity and integration. A necessary component of inkjet polymer printing will be a diverse set of printable materials. These include solution-based polymers and oligomers, nanoparticle suspensions, and other polymers that flow when heated. The range of current polymer-oligomer-nanoparticle capabilities includes electro-mechanical sensing and actuation, specialized structural support, and electrical conduction. Motion and force will not be gererated by motors, but by the expansion and contraction of dielectric elastomer actuators." Thin-as-film products are not new. In 1999, Randi Altschul was issued a series of patents for the world's first disposable cell phone. The paper-thin cell phone is composed of one piece serving as both an elongated flexible circuit and the body of the phone. The ultra thin circuitry is made possible by applying metallic conductive inks to paper. More recently, research firm Spraylat has introduced a line of printable polymer film inks. These ink materials make possible circuit components including conductors and resistors. What are the components of a robot that could be produced through inkjet printing employing flexonics and organic semiconducting polymers? Certainly, it would include electronic circuits (including transistors, diodes and resistors). Inkjet printers have also been employed to print batteries, RFID chips (for radio identification tags), organic light-emitting diode (OLED) display screens and electro-actuated polymers used as artificial muscles. Here is a brief look at each. Printable batteries: Power Paper is an inkjet printed dry-cell type battery that can generate 1.5 volts. Several cells can be used in tandem to generate more power. It uses zinc for the anode and manganese dioxide for the cathode applied in specialty inks. Because they can be printed onto paper, they are very flexible. Since there is no casing, the shape and size of the battery can be designed especially for each application. They are non-flammable, non-toxic and have a shelf life of over three years. Printable communications: Printable radio frequency identification system (RFID) tags are currently used on paperboard and carton packaging. These can be powered by printable batteries to make possible ID systems such as flat badges and non-passive RFID label systems. OrganicID is producing such polymer-based RFID chips as an alternative to more expensive silicon chips. Printable displays: Cambridge Display announced in August 2005 that they have developed a printable OLED (PLED) display using fairly traditional inkjet technology capable of printing 14-inch displays. The light emitting polymer PLED displays are very flexible and can be produced at a lower cost than conventional LCDs. Printable muscles: There are many polymer-based options for artificial muscles. One major category that lends itself to printing is EAPs -- electro-actuated polymers (see sidebar for a list of EAP materials). Electronic EAPs, such as electrostrictive, electrostatic, piezoelectric and ferroelectric are driven by Coulomb forces. This category of EAP material can be activated with DC voltages suitable for robotic applications. However, the high activation voltage required approaches the level at which the material may break down. These materials can be operated in air and have a greater mechanical energy density than ionic EAPs. Ionic EAPs include gels, polymer-metal composites, conductive polymers and carbon nanotubes. They involve mobility or diffusion of ions across an electrolyte sandwiched between two electrodes. The activation of the ionic EAP occurs at lower voltage (1 or 2 volts) than electronic EAPs and mostly produces a bending displacement. Their disadvantages include the need to maintain wetness and, for some, difficulties sustaining constant displacement under a steady voltage. The firm Micromuscle, in Sweden, utilizes EAPs in medical devices for positioning and guiding components inside of blood vessels during angioplasty procedures. They report that small voltages and low currents, typically 1 to 2 micro-amps to milli-amps suffice to activate the devices. 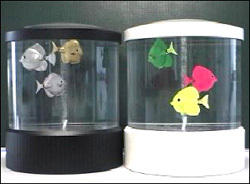 Eamex, in Japan, produces EAP actuators for autofocus or zoom in small cameras, but is best known by consumers as the makers of artificial fish that swim around in a plastic tank. The EAP actuator element is in the tail and electric power is supplied to a coil in the fish by the electromagnetic induction from the tank. Robot fish with artificial tail muscles. There is no reason why printed robots cannot be charged by induction similar to Eamex's artificial fish, though this would limit their area of operation to the vicinity of the charging coil. However "wire-free" recharging pads that inductively charge devices placed upon them is an alternative. Rather than creating a zone in which robots can operate, just have them return to their "pad" to recharge. "The capability to print robots as a consumer reality is limited primarily by the state of the art of EAP materials," he said. "Being polymers [EAP materials] benefit from their many attractive characteristics; they are lightweight, inexpensive, fracture tolerant and pliable. Further, they can be configured into almost any conceivable shape and their properties can be tailored to suit a broad range of requirements." Bar-Cohen imagines putting EAP materials into a form that can be sprayed out from a special printer much as ink droplets emerge from inkjet printers. The result might be an EAP-operated butterfly printed flat onto a sheet of paper when shipped, but which flaps its wings and flies off when released from its box. "My group is working on space related applications. Toy robots are not part of what we are doing in my lab but, as you can see from my books, they are part of the vision that I have for the development of EAP," said Bar-Cohen. Specifically, Bar-Cohen's group developed applications, including a dust wiper, gripper, and robotic arm for space exploration. "In my vision for the field of robotics in space I see one day when EAP material become very strong and robust [and] we will probably be able to produce biomimetic legged robots that can run as fast as a cheetah, carry mass like a horse, climb steep cliffs like a gecko, reconfigure its body like an octopus, fly like a bird and dig tunnels like a gopher. "Hopefully, these robots would be able to operate autonomously to detect water, various resources, and possibly biological indicators in the search for past or present life or even construct facilities for future human habitats," Bar-Cohen said. The first printed robot may more resemble a paper origami insect than an octopus. It would operate as a digital ugoku (moving) origami capable of locomotion under its own power and even performing preprogrammed physical tasks. So when will we be able to swap out the ink cartridges in our home printers and print out our own robot? How close are we to being able to print out a robot on a flat sheet of paper, fold along the dotted lines and have it move under its own power? "Such a capability is somewhat years away and it is difficult to predict how soon. Someone is going to be the first to make such robots and I am not sure if it is not already being investigated," Dr. Bar-Cohen said. If under development, it is certainly being done behind closed doors and under a tight veil of secrecy to gain an edge on the competition. And when printable robots do become available there will likely be an open source community to help you design and program your origami robot. Creating the design for the robot requires not only some knowledge of paper folding techniques but also the ability to engineer paper forms capable of locomotion once the power, control and drive elements are printed onto it. If the creation just lies on its back and moves its legs in the air, it is not much of a robot. Testing and improving upon the locomotion of simple computer-designed creations became popularized through Sodaplay. Sodaplay was the brainchild of London-based company Soda Creative Ltd. They created it as part of their ongoing generation of ideas, research and development -- but mainly just for fun. 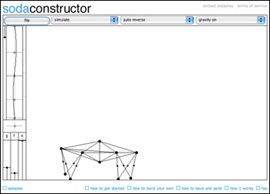 Sodaplay contains sodaconstructor, an area for constructing creations, and sodazoo, a place where you can view and test designs created by others. Sodaplay even includes tools to evolve the locomotive efficiency of your robot designs using applications of genetic algorithms. Printable robots won't soon win any arm wrestling competitions with their owners; but as 3-D printing, flexonics and EAP materials science advances -- can the flying butterflies be far behind? For links to the worldwide activities in the subject of EAPs (artificial muscles) click here. Gregory Daigle is a consultant in social technologies and e-learning and has been a professor of industrial design. His articles and blog are at The Unlit Pipe.